Why Program in SAS/IML Studio? Figure 1.2 shows the results of a program that evaluates the mortality of patients admitted to a certain hospital with congestive heart failure. The program uses a statewide database to build a logistic model that predicts mortality as a function of a patient’s age and the severity of her condition. 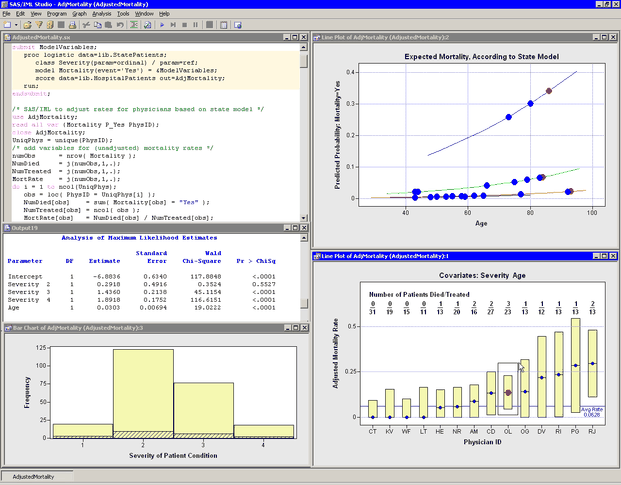 The program uses SAS/IML statements to compute an adjusted mortality rate (with confidence limits) for cardiac physicians employed by the hospital. The adjusted rates are based on the observed number of deaths, the expected number of deaths (as predicted by the statewide model), and the mean number of deaths for this hospital. The program implements many of the features listed previously. It creates a custom graphic with explanatory text. It calls DATA steps and the LOGISTIC procedure. It extends the results of the LOGISTIC procedure by using SAS/IML statements to compute adjusted mortality rates. It presents SAS/IML Studio’s dynamically linked graphs to enable you to explore why some physicians have high rates of patient mortality, to decide whether those rates are unacceptably high, and to evaluate the overall performance of this hospital’s staff compared to staff at other hospitals in the state. Although not shown in Figure 1.2, the program even uses a dialog box to enable you to choose the explanatory effects used to create the logistic model.